Legendary actor John Travolta is stepping into the shoes of the late Gambino crime family boss John Gotti. Travolta stopped by "Good Morning America" Thursday and shared what it was like playing the character in front of Gotti's relatives, who served as advisers for the highly anticipated film "Gotti." "[It's] a good pressure," Travolta said. "I felt like I needed all the support I could have and that family was willing to be 24/7 with any question, any home footage, their books, their advisories; and I used it all because like I did with [defense lawyer Robert] Shapiro in ‘The People v. O.J.,’ you can't be distracted by my familiarity." He went on, "You have to be lured in by becoming that person. So, that's really what I tried to do and they [Gotti's family] thought I had arrived, so I was very proud of it." John Travolta, right, as John Gotti Sr., in a scene from "Gotti." Gotti died in prison in 2002 at the age of 61. He had been serving a life sentence after being convicted for murder and racketeering in 1992. To immerse himself in his role as Gotti, Travolta said, he even wore some of his actual clothing. "That was the haunting part because in the opening and closing of the movie, I actually wear his overcoat ... and his cologne was on the coat and the scent was apparent and, actually, it helped in an interesting way because he was quite a character," Travolta, 64, explained. Tuesday was John Travolta Day in Brooklyn, New York, where fans celebrated the actor at Lenny's Pizza, the restaurant made famous in "Saturday Night Fever." Travolta also promoted the new film in the New York City borough that he said made him famous. 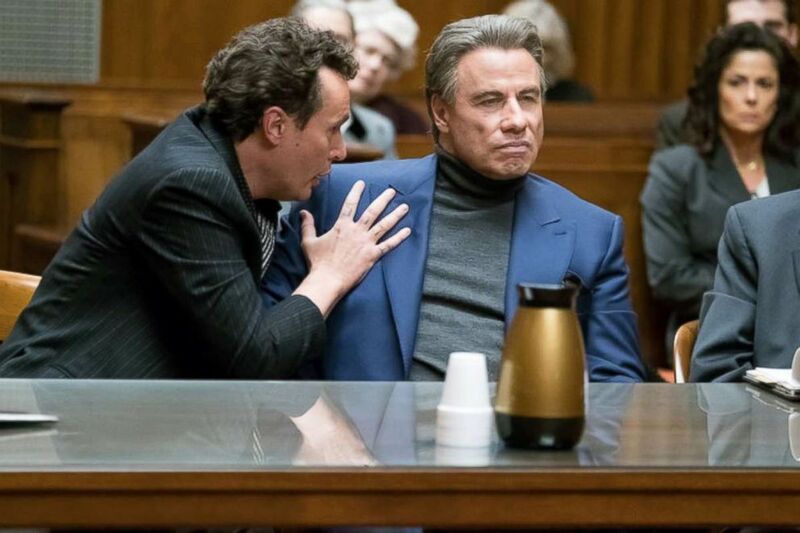 "If you think about "Welcome Back Kotter," "Saturday Night Fever" and "Get Shorty"... those charters were based in Brooklyn and now to top it off with Gotti is the ultimate love letter to New York and to Brooklyn," so there you have it," Travolta said. Among his notable films, "Grease" is celebrating its 40-year anniversary. Travolta couldn't put into words why the beloved musical resonates with so many generations. "I know that I love it," he said of "Grease." "I've always loved it." When asked who is a better dancer -- his “Grease” character Danny Zuko or Tony Manero, whom he portrayed in “Saturday Night Fever -- Travolta said, "they both rocked it pretty good." "I'm going to give them a tie," he said. "I have to."